The interim report on the hunt for weapons of mass destruction in Iraq has vindicated the UK's decision to join the war, Foreign Secretary Jack Straw has said. 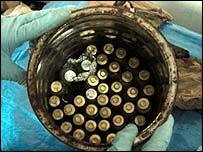 A US-led interim report said no banned weapons had so far been found in Iraq, but there was evidence of related research and equipment concealed from inspectors. Mr Straw said these finds showed the military action taken by the United States and the UK was "justified and essential". But anti-war critics have seized on the first report from the Iraq Survey Group, led by David Kay, as evidence that the coalition went into the conflict on a false basis. Shadow defence secretary Bernard Jenkin, who backed the war, renewed Conservative calls for a judicial inquiry into the reasons for going to war. He said the report showed Saddam Hussein's ambitions to acquire weapons of mass destruction, but his immediate threat to the UK had been overplayed. Mr Jenkin said: "This underlines the need for an independent judicial inquiry into the quality of intelligence and how it was communicated to Parliament and the public. "A much wider question than the present Hutton Inquiry." Anti-war protesters said the fact no weapons had been found meant the government should apologise for going to war. 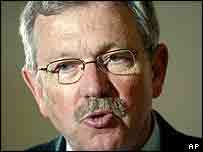 Andrew Murray, chairman of the Stop The War Coalition, said: "This confirms that the reasons given to the British people for going to war against Iraq were false. "The prime minister now owes the nation an apology." Prime Minister Tony Blair on Friday met Kuwaiti Prime Minister Sheikh Sabah in Downing Street to discuss the post-war situation in Iraq. Mr Straw said the survey group's report provided "further conclusive and incontrovertible evidence" Saddam Hussein was in breach of UN resolutions, said Mr Straw. Has the so far fruitless search for weapons of mass destruction in Iraq affected public opinion? "Kay's report confirms how dangerous and deceitful the regime was, and how the military action was indeed both justified and essential to remove the dangers," he said. The foreign secretary told BBC Radio 4's Today programme the fact no weapons of mass destruction had been found did not mean they did not exist. And he said there was no doubt that Iraq had posed a "current and serious" threat - the claim made by Tony Blair in the government's controversial Iraq weapons dossier. "If we had decided not to take military action in March or thereabouts, what would have happened is all the pressure on the regime would have died away because we could not have maintained that military readiness," he added. Head of the CIA-led survey group Mr Kay said it was too early to reach definitive conclusions. But he said he had found evidence of WMD-related programmes and suggestions that Saddam had been "firmly committed" to acquiring nuclear weapons. His report said: "We have not yet found stocks of weapons but we are not yet at the point where we can say definitely either that such weapons stocks do not exist or that they existed before the war and our only task is to find where they have gone. "We are actively engaged in searching for such weapons based on information being supplied to us by Iraqis." Former Foreign Secretary Robin Cook, who quit the cabinet in protest at the Iraq war, said: "We always knew that Saddam had ambitions and military pretensions. But what we now know is that our strategy of containment worked." Liberal Democrat foreign affairs spokesman Menzies Campbell said: "This report once again puts the government on the defensive and adds weight to the conclusion that we went to war against Iraq on a flawed prospectus. "It may also undermine the validity of the Attorney General's (Lord Goldsmith) opinion that war was lawful." Dr Kay's 1,200-strong team has been searching Iraq for the past three months. But he said this report only provided a "snapshot" of the investigation and not a "final reckoning". "The fact that they've not found weapons... does not mean that they are not there"